Who’s winning the hearts of consumers online? Pure-play e-commerce businesses or e-tailers, traditional retailers who have entered the online area? 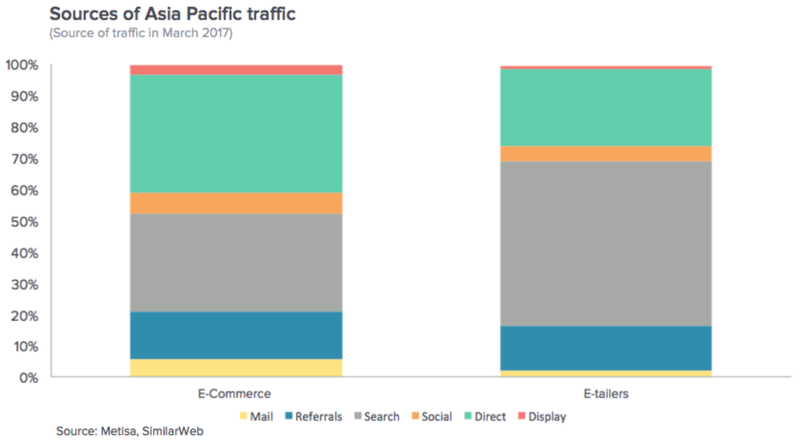 In this article, we compare 10 leading e-commerce against 10 leading e-tailing businesses in the Asia Pacific region to see how they shape up in terms of growth, engagement, and sources of traffic. This analysis is based on our market reports, where we analyze over 400 popular e-commerce websites in Asia. To see the full list of companies that are included in this analysis, please check out our reports. The traffic and engagement data you see here is sourced from a third-party, independent source called SimilarWeb. SimilarWeb uses sources such as local internet service providers, monitored devices, web crawlers, and direct measurement sources to estimate traffic data, time on site, bounce rate, and other metrics. We observe that e-commerce players tend to do better in the fashion and beauty verticals. These strengths reflect how many of these players source their goods. Many of the biggest e-commerce firms use marketplace models where they list and aggregate brands. Most e-tailers, on the other hand, use vertically integrated models where they produce their own products. This means that e-commerce firms tend to have more traction in verticals where they can easily collect and then sell a wider range of goods at lower prices than their e-tailer counterparts. Industries like home, food, and luxury are more difficult for them to do well in because the goods in these verticals are either difficult for third-parties to buy and store in large quantities and range (such as in food and home) or are highly limited in quantity (such as in luxury). E-commerce players who use marketplaces also tend to have thinner margins - because they aggregate products from third-party sellers, they make less from sales than they would have if they produced their own goods. How do engagement metrics compare across business models? Observation #1: E-commerce businesses are noticeably better than e-tailers at getting visitors to spend time on their websites. However, pages per view and bounce rates are broadly consistent. This might be because e-commerce businesses, being purely focused on the online channel, invest more in making sure customers stay on their sites. Observation #2: E-commerce players have wider variance than e-tailers in engagement metrics. This might indicate that e-tailers have a brand and reputation that gives them solid ground for launching their online experience. Their established reputations usually guarantee them a certain level of success upon their online store’s launch. E-commerce companies, on the other hand, must build their brand value from scratch. Their success greatly depends on their ability to provide great online customer experiences. E-commerce businesses might also be more vulnerable to competition. These companies have had less time than e-tailers have had to build their brand and differentiate themselves from their competitors. This may mean that many of their customers are likely to switch or use their competitors' platforms because they have yet to develop a strong brand attachment. How does each vertical draw web traffic? Observation #1: E-commerce players are more effective than e-tailers at using mail and social media to drive traffic. In terms of mail traffic, for example, the average e-commerce firm’s share of mail traffic will be more than double the average e-tailer’s share of mail traffic. This suggests that e-commerce players are more proficient at online outreach methods. It is interesting to note also that the % share of email traffic in Asia Pacific is significantly lower than US counterparts who can attribute up to 10% of traffic from email. Observation #2: E-tailers receive most of their visitors from search. This can be attributed to retailers typically being established and trusted brands in their vertical. Customers know them and will instinctively search for them online. Observation #3: E-commerce firms receive most of their visitors from direct means. This suggests that customers know their online addresses much like they would know that a physical store exists in a certain mall. Visitors arriving at a site via direct means are more likely to be repeat visitors who have recognized the value of that site and are returning to access that particular value. E-commerce firms are more likely to receive this type of visitor because they typically advertise a specific form of value (niche products, lower prices etc.). We hope this information has been useful, and we welcome your comments, feedback, and suggestions below. To find out more about what we do at Metisa, reach out to us at hello@askmetisa.com. If you are interested in the details of companies that are included in this analysis, please check out our market reports.